If you are in business, you need a website. Just like a sign on your building, you need a site to convey basic information to current and potential customers. We make it easy for you to communicate your basic information. 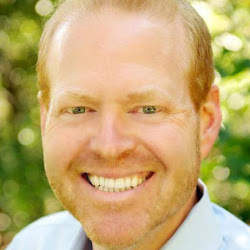 You don’t need to sell anything online to be successful with your online marketing. The goal of a basic business website is to convert browsers into buyers and have them call or walk in the door. Todays buyers will browse two or three competitors websites to see who can best serve their needs. Your phone number, address, map, logos, photos, products and services are critical to your online presence. 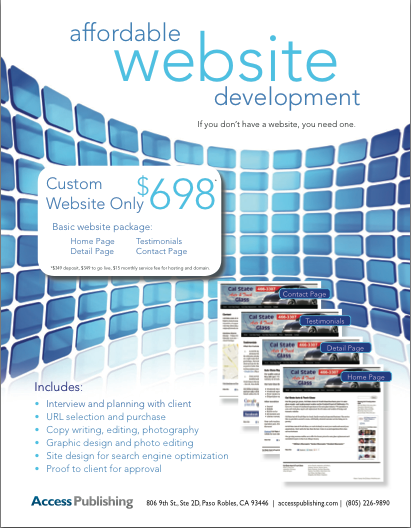 Our basic website development package starts at just $698. It’s a perfect fit for any small business. It includes an interview, analysis, keywords, copy writing, graphic design, and search engine optimization. Your website will help get your business found on the web. Get started by calling us or coming into the office today. You will pay a $349 deposit to get started. A second payment of $349 is due when your site goes live. Website hosting is $15 per month. Call us at (805) 226-9890. The most effective way to keep your site noticed online is fresh content. It’s the most powerful form of SEO on the Internet. You can call us, drop by the office, or email us to make changes to your site all year long. So when you need assistance writing and posting about new products, services, employees, and crafting news articles, press releases, blog posts or special offers, just give us a call. Ongoing writing, editing, design and consultation is only $75 per hour. Access Publishing has 20 years experience and expertise in local small business marketing and advertising. We help business owners craft compelling messages to potential customers. Use our expert writers, graphic designers and SEO specialists to help bring more sales in your door. Access Publishing specializes in serving small businesses in Paso Robles, Atascadero, Templeton, San Luis Obispo, Grover Beach, Pismo Beach, Shell Beach, Avila Beach, Oceano, Arroyo Grande, Nipomo, Morro Bay, Los Osos, Cambria, Cayucos, Harmony, San Simeon, Creston, Heritage Ranch, Oak Shores, Shandon, Santa Margarita, San Miguel and all of San Luis Obispo County.